There are so many drapery lining fabric choices, picking one can feel daunting. I’ll break down the different options and features so you can pick the one that will work best for your window treatments. When making back tab curtains for my living room, I wasn’t sure if I wanted to use a drapery lining or not. And if so, there are so many choices, which one do I pick? At first, I was a little hesitant about using a lining because my living room is north-facing and can be a little dark. I still wanted light to come through even when the curtains are closed. Drapery linings can range from lightly filtering light to blocking it out completely. Plus they do so much more than just blocking light! Drapery Lining is used to line curtains for many different reasons, both aesthetic and practical. 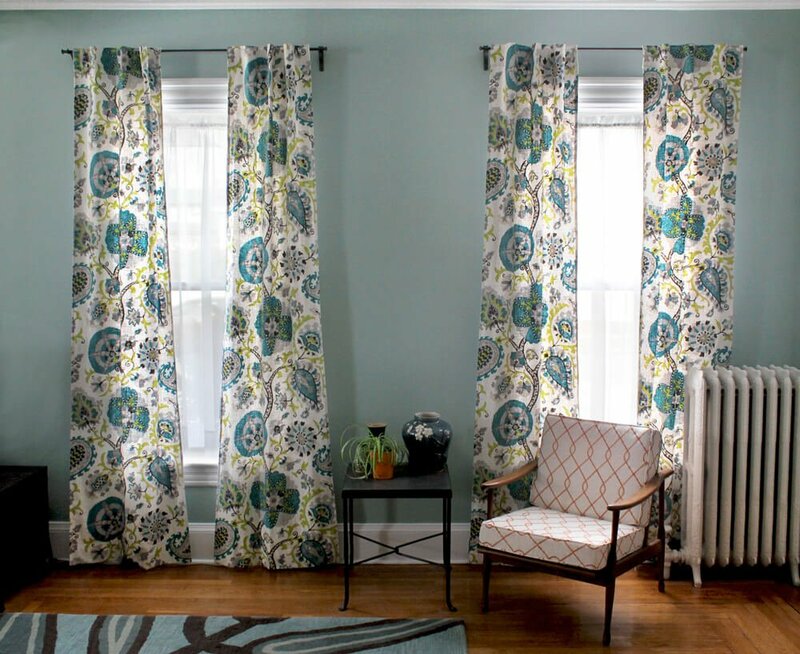 Drapery lining makes curtains drape better because it adds weight and body and can create full, well-defined pleats. It also gives curtains a polished, professional look. Water repellent and resistant drapery lining is designed specifically to protect the face fabric from moisture. Condensation on the window or rain from a forgotten open window can stain and damage your fabric. Water-repellant drapery lining shields your curtains from unwanted moisture. Many water-resistant linings are also stain and mildew resistant. They are a good choice for kitchens and bathrooms. A common reason to use drapery lining is to block light. Blackout drapery lining is specifically designed to block most or all light. Does the morning light wake you up too early? Do you work late shifts and have to sleep during the day? Blackout lining is the way to go! Blackout lining is made by taking a base fabric and first spraying it with a white acrylic foam. Then it’s sprayed with a black opaque membrane and finally another coat of white. This is referred to as 3 pass lining. There is also 2 pass, which skips the first coat. Both block the same amount of light, but the 3 pass has finished surfaces on both sides. If you’re using drapery lining alone or in an application where both sides are visible, go with the 3 pass. Bump drapery interlining is particularly effective at thermal and noise insulation. Because it’s thick, bump is often used to create fuller, heavier looking draperies that have a luxurious feel. It’s commonly used with silks and taffetas. Bump is an interlining, meaning it should be sandwiched between the face fabric and another drapery lining, often blackout. If you’re looking for flame retardant drapery lining, there are several linings that fit the bill. Flame Retardant (FR) linings are often used in commercial settings to meet fire codes. Material: You can choose from poly cotton blends, 100% cotton, or 100% polyester. Color: Most are available in white or ivory and some in black. Luster: Some linings, like a sateen, have a sheen to them, either high or low luster. Care: Dry cleaning is recommended for most drapery linings. 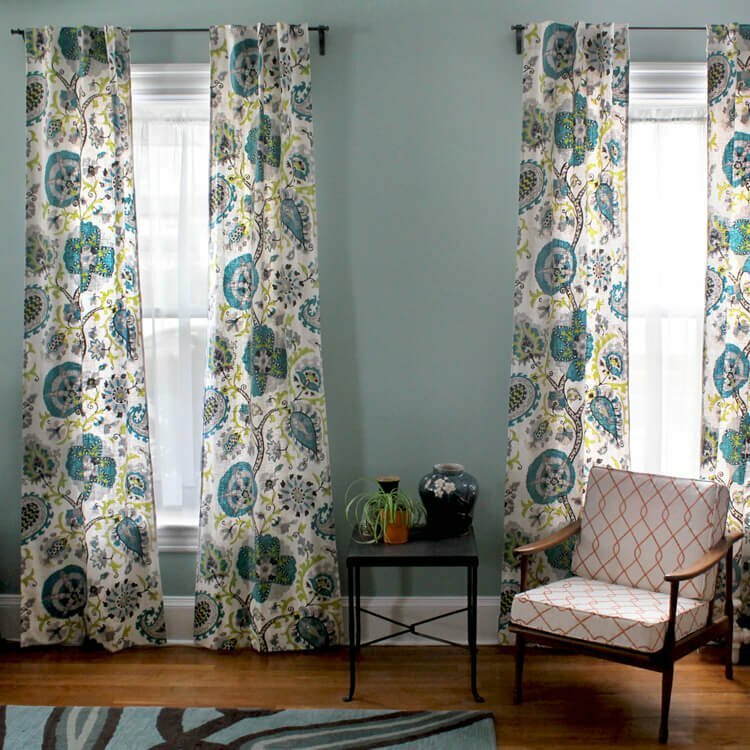 Using a lining fabric and a face fabric with the same cleaning instructions is a good idea so your curtains can be cleaned if need be. Weight: For many applications, it’s a good idea to get a lining that is similar in weight to your drapery fabric so that they drape similarly. Hanes Heavy Flannel Drapery Lining is often used for swags, jabots, cascades & roman shades. Roclon Supra-lon Drapery Lining is light and airy and works well with lighter face fabrics. Warm Window is a thick, 4-layer insulated fabric used specifically for its excellent insulation properties. Looking for curtain tutorials? Find ours in Interior Decor How To’s. Because drapery lining has so many beneficial qualities, I decided it was the right choice for my curtains. For me, Roclon Rain No Stain White Drapery Lining had the right combination of features. I liked that it it provides protection from oil and water-borne streaks and stains, it’s wrinkle resistant, 100% cotton, made in the US, inexpensive, and can be washed or dry cleaned. The other big selling feature is that it’s insulating, providing another buffer between me and the cold New England winters! The right drapery lining for you depends on your needs. Luckily there are a lot of choices! See our selection of drapery lining. 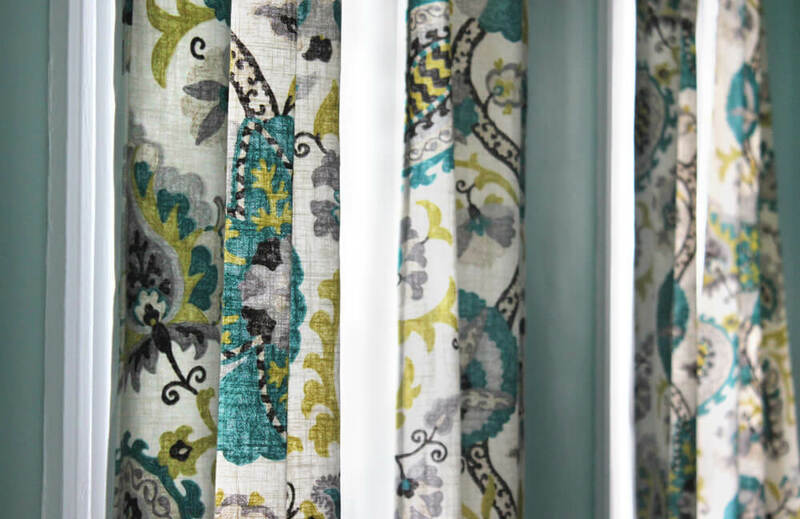 Click here to find the drapery lining that's right for YOUR curtains. BEST ANSWER: I'm sorry, I don't know what you're referring to. I am making valances using cotton slub fabric. My pattern calls for a lining. I’m thinking a light weight fabric would be best. Any suggestions? BEST ANSWER: Yes, a lightweight lining would likely work well. A number of the non-blackout lining would work, including Hanes Rain No Stain. When using blackout lining on panels that will close and meet in the center, how do you finish off these leading hems? Are they sewn and the light comes through or is there some type of adhesive that can be used? Depending on what style of heading you're doing, you can leave a flap on one of the leading edges so they will be able to overlap. This wouldn't work on rod pocket curtains very well, but should work on most other styles. For example, with the back tab curtains, one of the tabs on the leading edge could be moved further in so the edge could overlap the other panel. You may get a little light leakage, but no direct light. I suppose you could put strips of velcro on the backs of the leading edges (so you can't see it when open). If anyone else has suggestions, we'd love to hear them! Is the blackout lining too heavy to work for Roman shades made with decorator fabric? BEST ANSWER: Blackout lining should work fine for Roman shades. I have purchased Sunbrella brand fabric (100% polyester) to have grommet top drapes made for in a sunroom. I want to use a lining that will provide some insulation qualities for cold winters without adding a third layer of interlining and the additional weight of a third layer. I also prefer a crisp white-white color vs. an off shade of white. Suggestions, please? BEST ANSWER: Hanes White Thermafoam Drapery Lining Fabric would be the best fit! Can you recommend a lining material that blocks most light and is also washable? The lighter weight the better. BEST ANSWER: Dry cleaning is recommended for all our blackout and room darkening linings. This doesn't necessarily mean you can't wash them, but we can't attest to the results. I'd say the Hanes Apollo and Hanes Outblack are probably the most likely to be fine when washed on cold. The Apollo is the lighter of the two. If you do decide to wash it, definitely pre-wash before making the curtains. i am making 20' drapes that are not being made to be functional. They are only to add color to the room. I am looking for a lining and am having a hard time deciding what kind to go with. DO you have an opinion? I don't want a heavy material, but i do want the lining to protect my fabric from the sun and other wears. BEST ANSWER: After working with the Roclon Rain No Stain Drapery Fabric many times and using it in my own house, I can say you can't really go wrong with it for non-blackout applications. If you look at the comments and reviews, our customers agree and come back to it for many projects. Of course, there are many other great options, but this lining checks a lot of boxes. I am debating between the Hanes Heavy Flannel Drapery Lining and the Hanes Natural Classic Bump Drapery Interlining. I would like it to be as thick and heavy as possible. Is one thicker than the other? BEST ANSWER: Yes, the bump interlining is heavier. Since it's an interlining, which goes between the drapery fabric and the lining, you would have to use a drapery lining as well. You could even use them both together for maximum thickness. How wide are the fabric lengths? BEST ANSWER: All our drapery linings are 54 inches wide, with the exception of Hanes Apollo, which is 60 inches wide. I notice in the picture, the lining is tucked under the hem. What is the difference doing it that way vs leaving it to hang free on top of the hem? BEST ANSWER: It can be done either way. Generally, tucking it under is the more "DIY" way of doing it. For a more professional look, the face fabric hem can be blind stitched so the thread doesn't show on the front, then the lining is sometimes left hanging or is hand stitched to the hem. what lining drapes best in making swags?